Home New Product Smoant Battlestar Squonker Kit Preview – Dual Battery Push Button Squonk! Smoant Battlestar Squonker Kit Preview – Dual Battery Push Button Squonk! The Smoant Battlestar Squonker Kit is a new release from the Battlestar Range. The Battlestar range have generally been quite recognisable for their simple black or yellow colour. Previous versions include the original 200W version, the Mini and the Nano. 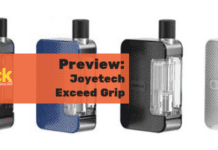 As the name of this kit suggests – this is a bottom feed squonk version of the kit. You will need 2×18650 batteries and the maximum output is 200W. One great feature which stands out is the “Squonk Button”. Basically this pumps the liquid from the 7ml squonk bottle to the BF 510 pin in the RDA. This apparently helps prevent over squonking too. This is a fully regulated device with a 0.96in OLED screen mounted on the front. There are Variable Wattage, Variable Voltage, DVW (Custom Wattage Curve), TCR and Temperature control user modes to choose from. The full kit includes the Battlestar Squonker RDA with a dual coil build deck and side adjustable airflow. The RDA already has the hollow bottom feed 510 squonk pin installed but the kit does include a solid 510 pin if you want to use this as a dripper. 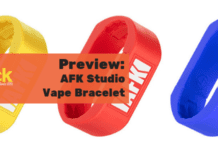 There are 4 colours available – Black, Yellow, Gun-metal and Gradient Blue. There is quite a market for regulated dual battery squonkers right now and this looks like it could be a decent competitor! Will you be pre-ordering the Smoant Battlestar Squonker Kit? Let me know in the comments below!